It is always a pleasure to be invited to the Southport Charity Committee Coffee Mornings and this one was no different! The Charity Committee Coffee Mornings are a great way to get to know and understand the hard work and dedication which gets unnoticed. It is also a fantastic way to keep up to date of how the charities are using the money and how we as a community are raising funds for the charities as well. The Prince’s Trust is a charity in the United Kingdom founded in 1976 to help young disadvantaged people. They run a range of training programmes, provide mentoring support and offer financial grants to build the confidence and motivation of disadvantaged young people. 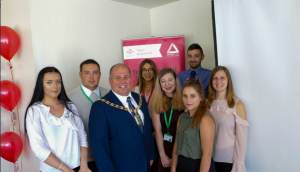 This presentation was to celebrate Southport Prince’s Trust team 2 for their success over the past 4 months. It was an honour to be invited to the presentation and I was thankful that I was given the opportunity to thank appreciate all the hard work which the members of team 2 have put into the program to be such a success. I accepted this invitation for the United Voice Choir ‘Joseph’ Production with great excitement and delight as I have heard many great things about the production, especially as it has been a community Choir that has been running for 10 years. The organisation has also been invited to participate in the next Armed Forces Day in the Diana Gardens which speaks volumes of how good they are and how well the production ran. It always fills me with great pride when I get the chance to welcome new citizens into the United Kingdom on behalf of her Majesty, and Thursday was no different. It was a pleasure to present 8 new people their United Kingdom Citizenship. These 8 new citizens came from all over the global, from Asia all the way to Africa. 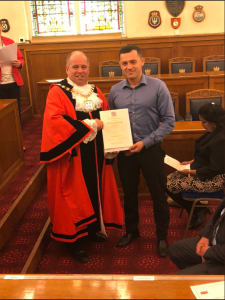 These ceremonies are always very interesting as it gives me the opportunity to find out where some of the new Citizens came from and even sometimes I get the opportunity to find out how and why they came to the United Kingdom. I always find the Charity Coffee Mornings very intriguing and fascinating as it gives me the opportunity to find out what goes on behind the scenes and it is a great reminder of how the community rallies together to aid others who need the support. Athena Healthcare gave me the opportunity to speak to both staff and residents about the fantastic job which is being done here and how the Athena Healthcare Centre is more than just somewhere people come and get treatment, it’s also a place where residents get the opportunity to take their minds off their health issues just for a little while and have a little laugh with friends and family.